Configure any action – turn page, play video, maximize image, etc. - to be triggered when a predefined key or keyboard shortcut is detected. Combined with text-to-speech and a Braille keyboard, touch experiences become accessible for the physically and visually impaired. This feature even makes it possible to use a clicker to remotely navigate through your experience as most clickers simply simulate keyboard presses (left/right arrow keys). Open the experience properties by right-clicking the experience in the Scene Structure panel - always the topmost node - and selecting Show properties. If the Properties panel is already open, it is sufficient to left-click the experience in the Scene Structure panel. Then activate/deactivate the Navigate using arrow keys property. the right and down arrow keys on your physical keyboard will call the Next action. the left and up arrow keys on your physical keyboard will call the Previous action. If any of these key presses (e.g. left arrow key pressed) is redefined in scene (see below), the associated navigation action will be overridden thus not called. The following triggers are associated with specific keys on the keyboard and can be associated with actions at either the experience or scene level. 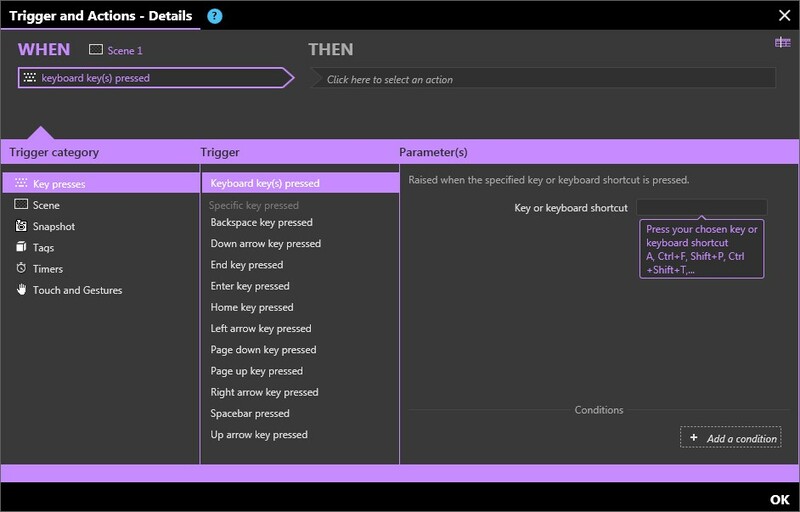 The Keyboard key(s) pressed trigger enables Intuiface to detect any key or keyboard shortcut. When selecting this trigger, press the key or combination of keys before selecting the action(s) you will call. A keyboard shortcut is two or more keys pressed at the same time. One of those keys is either Shift, Ctrl, or Alt. 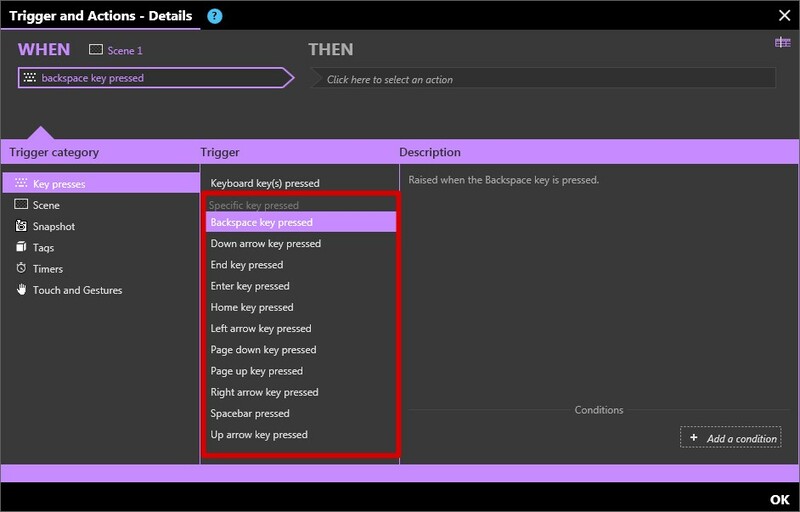 To avoid exiting the experience when pressing the ESC key, you can use the ESC key in the sequence to trigger an action without effect (such as changing a property of a non visible asset). Here are some usage examples you will be able to see and test in the Da Vinci - Accessible sample found in the Marketplace. Use arrow keys for scene-to-scene navigation.